Hey. We need to talk. 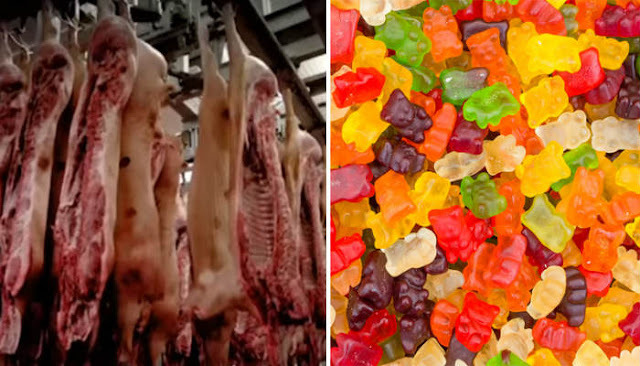 It’s about your gummy snack problem. I get it; I’ve been there. I know how those juicy bears and worms conjure up memories of childhood. But that warmth comes with quite a high cost. Those gummies are terrible for you. They always have been. A single serving – 18 gummy bears – contains as much as 22 grams of sugar. That’s 5.5 teaspoons, or 58% of your daily sugar intake. Eating too much sugar, particularly the added variety in gummy bears, leads to a barrage of health problems. That includes cavities, an overactive appetite, weight gain, diabetes, high blood pressure and heart disease. Sugar is also highly addictive, which is why you’re likely totally unphased and still craving gummy bears right now. Don’t worry, I’m going to change that – not with a 12-step program but with an in-depth look at the horrors of the gummy trade. What if I told you that, for you to enjoy those bites of bliss, this needs to happen? Have a look at Alina’s full footage below to see more startling images from the production of jelly candy. Of course, you’ll also want to stay away from using gelatin in your own cooking. Instead, use organic agar. Agar is a vegan gelatin substitute derived not from animal remains but seaweed. It produces a similar texture without all the ickiness. Have a look at this post for an agar marshmallow recipe.